I've already purchased, downloaded, or otherwise cribbed more music in the first two months of this year than I did in all twelve months of last. Unlike Hollywood, the music biz has a knack for front loading the early months of the year with typical blockbuster results. A few items to be aware of... that is if you share my taste in music. Yuck. Yuck is both the band name and the title of their debut album. Read any blog or review of their music and the inevitable mention of Dinosaur Jr or Sonic Youth are repetitious, yet undeniable. At a compact 48 minutes, their album is immensely entertaining and full of talent to burn, evoking that nineties sound of slurring guitars and lazy lyrics like old pros. The Twilight Singers. Been a fan of Greg Dulli since The Afghan Whigs... a band that was all the rage in the early nineties (and whose phenomenal album "Gentlemen" still stands the test of time as a crushing collection of dread-filled love songs and anguish). I'm glad Greg hasn't gone softly into that sweet night, still tooling around in various outfits and still screaming his lungs out. The Twilight Singers have been producing some great, obscure music since the early 00's and their latest is due out next week. The parts I have heard are just as radiant as anything else they've completed. Not to mention new releases from Mogwai as well as And You Will Know Us By the Trail Of The Dead that have yet to be released from their packaging. Yes, my friends, I'm a child of the 80's and 90's and I still buy cd's. Plus there's a new album by this little band called Radiohead that I'm (again) fully falling in love with. 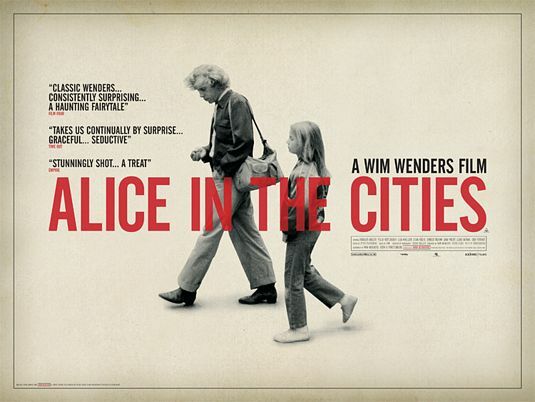 Wim Wenders "Alice In the Cities" could be considered the first in a long line of films that deal with the search of.... something. Released in 1974, next would come his opus travelogue film "Kings of the Road", followed years later by men and women wandering the continent in diverse efforts such as "Paris, Texas", "Don't Come Knocking" and especially "Until the End of the World". Wenders common narrative device is the travelogue film and no one does it quite like him. Starring Rudiger Volger, "Alice In the Cities" deals with that standard 70's and 80's storyline about the adult saddled with a precocious young 'un. But the difference here is the film's utter lack of emotion. Volger does bond and seemingly come to care for the 9 year old girl (Yella Rottlander) left to him unexpectedly by a woman he befriends while waiting for a plane ride home out of New York, but Wenders style is disassociation with feelings. When the young girl leads her guardian on a wild goose chase to track down her grandmother, Volger's reaction is one of quiet frustration, followed by a stirring of his coffee and then a "ok, what next?" Like the observational exactitude Wenders shows in the film's many passing car window shots (by great DP Robby Muller), "Alice In the Cities" not only lays a profound blueprint for the sensibilities of Wenders the director, but it's a quiet film that revels in the settling relationship between two people through conversation and body language. While "Alice In the Cities" does traverse the great shores of America, through the admitted ugliness of Amsterdam by its two lead characters and eventually into the boroughs of Germany, it's mainly an internal film about Volger's failed journalist. In the opening of the film, we see him addicted to snapping Polaroid shots of mundane items as he travels by car to New York. Once there, we learn his publisher is furious at the fact that all he has to show for his bounces around the U.S. is a box of photos. His notepad, full of "scribblings" reveals no story. He holes up in a hotel room, annoyed by the continuous rantings of TV commercials and talk radio and smashes his television set on the floor. So, naturally, the prospect of towing a 9 year old around the world with little or no direction on how to find her relatives seems like an inviting chore for Volger. And it's in this emptiness that "Alice In the Cities" begins to manifest a sincere appreciation of story. The ending, both uplifting and subtly moving, sustains the idea that the journey is often times more rewarding than the destination. As in "Alice In the Cities", this is an idea Wenders has been reworking magically for decades. This film is not available on Region 1 DVD. Chris Eska's "August Evening" feels like a seminal Texas film. In capturing the humid, lazy evenings of Southeast Texas and those beautiful orange skies that temporarily pop up in the summer months, "August Evening" speaks volumes about a certain lifestyle. But things can also be hard in this idyllic setting, as the film soon reveals. After the death of her mother, Lupe (Veronica Loren) and her migrant worker father-in-law Jaime (Pedro Castaneda), leave their small shack and bounce back and forth between family members in San Antonio as they desperately try to find a place in this quickly evolving world. Lupe, once married but resistant to meeting anyone new for oblique reasons, forms a relationship with Luis (Walter Perez) that develops in patient, gentle ways. The initial reaction to "August Evening" is to lump it in with other films that document the rough struggle of Hispanic men and women to fit into the American sideline of life. But a majority of the men and women in Eska's film have already successfully adapted and conquered the hardships of this transition. Jaime's daughter, Andrea (Grisel Rodrigues) is married to a rich white man... so busy with her own life that she doesn't even spend a day at home with her father after the funeral of her mother. And when Jaime and Lupe travel to San Antonio, she gives them shelter for a few days, but finds that putting up with two more people in their luxurious house is too much of a chore and shuttles them off to Victor (Abel Becerra), her brother. Victor's situation is just as stressful, compromised all the more when Lupe mistakenly allows Victor's youngest son to wander away from the house... a plot device that spells out just how vastly different life is from their country shack to the cosmopolitan San Antonio. The main point of "August Evening", while drawing out small sketches of personality in its well-drawn characters, is that life is hard in America, but it's even harder amongst this individual family. Filmed in the mid-Sothern parts of Texas such as Boerne and Gonzales Texas (i.e. the hinterlands south of Austin and north of San Antonio), Eska nails the laziness these parts of the exude. And while the brilliant sunsets and humidity leak off the screen, most realistic is the sound of crickets that swells and dies off in one scene. Anyone spending any time in Texas surely understands that unmistakable chorus. 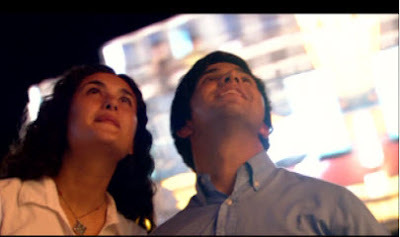 Released in 2008, "August Evening" was a feature in South By Southwest that year after winning the John Cassavettes award at Sundance in January. The award, which recognizes the best feature made for under $500,000, gives filmmaker Eska a bright future, but once one watches "August Evening", the proof is right there on the screen. 1. Goliath- Micro indie auteur David Zellner's story about a man who finds his life coming apart. I wasn't a fan of Zellner's previous film "Dear Pillow", but this film did win some great word of mouth at the '08 Sundance Film Festival. 2. Everything's Fine- Robert DeNiro received some subtle praise for this film about a man who tries to visit and reconnect with his children. This one kinda got lost in the shuffle. I meant to watch it towards the end of 2009, then never did, then it just ended up in the middle of my queue. 4. Joy House- Rene Clement's mood 60's crime romance about a gangster hiding out in a mansion, falling for two different ladies... one of them Jane Fonda. Part of the Alain Delon box set released early last year. 5. Night Train To Munich- Directed by Carol Reed.... Nazis... World War 2 intrigue. I'm already hooked. 6. Femme Fatale- Giving this one a re watch. Definitely the high point for DePalma since the late 90's. I haven't seen it since watching it on opening night and wonder if it holds up. 8. The American Friend- I'm about to go on a Wim Wenders bender. Recently, a friend gave me bootleg copies of two Wenders films that have always eluded me- "Kings of the Road" and "Alice In the Cities". Can't wait to dig into those two as well as revisiting this late 70's German New Wave masterpiece that blends American crime, comedy and film noir into a trance-inducing thing of beauty. 9. The Deep- I feel I've seen this one, but upon looking over the filmography of Peter Yates after his recent death, it was one of the few I didn't have rated. Nazi gold, deep sea diving, Jacqueline Bisset.... and all on Blu Ray as well! 10. The Sender- This is one of those shots in the dark that can either yield a tremendous experience or another early 80's trash horror flick. I added it last year during the month of October and just continued to shift movies over it. Recently, while thumbing through an old copy of Film Comment, I noticed the film listed on several "Ten Best" lists in that issue from '82. The story: "When a young man (Zeljko Ivanek) attempts suicide and fails, he's rewarded with a long-term stay in a mental hospital, where he begins exhibiting even stranger behavior. A staff psychiatrist (Kathryn Harrold) seems to be the only one willing to believe that the new patient is telepathically controlling the minds of the doctors and patients around him. But just how is he able to unleash his darkest nightmares upon them?" Thoughts on any of these titles or ones I should add, please drop a comment. Robert Guediguian’s “Army Of Crime” and Peter Weir’s “The Way Back” exemplify two of the most prolific and popular genre threads of the second World War: resistance and incarceration. 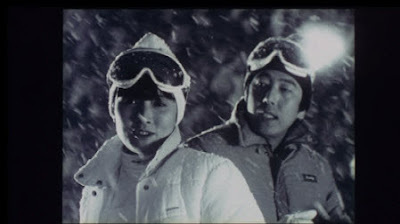 In fact, it could almost be believed that the select few survivors in “Army Of Crime” morph into the headstrong and resilient escapees in Weir’s brutally harsh drama about seven people trekking 4,000 km to freedom. 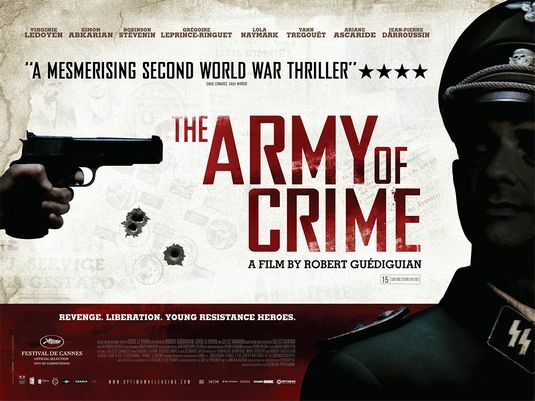 Upon first glance, “Army Of Crime” seems like a reductive title and all the more derivative for its mimic on the great Resistance film by Jean Pierre Melville’s “Army of Shadows”. But as Guediguian’s film later offers, the title comes as an ironic pitch of freedom, taken directly from the propaganda quotes plastered on posters by the German Army. While the initial reading of the title seems to infer the Resistance group, led by Armenain poet Missak (Simon Abkarian), are condemned for their violent acts, the reading of this famous quote at their quasi trial and conviction evolves into a rally cry of patriotic crusading. Still, all that rhetoric aside, “Army Of Crime” is an immensely moving and lovingly crafted documentation of the very origins of the French Resistance, led by foreign immigrants and Franco-Jewish outcasts. There’s the aforementioned cell leader, Missak, trying to shelter his beautiful wife (Virginie Ledoyen in a great performance) from the possible consequences of his actions. He leads several young men into retaliation missions around Paris. There’s Marcel (Robinson Stevenin) a promising swimmer who can’t control his hatred of the German Army and carries out solo assassinations by himself. His fourteen year old brother Simon (Leopold Szabatura) is also caught up in the violence. The sensitive young Thomas Elek (Gregoire Leprince-Ringuit) discovers just how hard it is to throw a grenade into a brothel. Like “Army of Shadows”, Guediguian’s film tracks a myriad of characters where deception and snitching is only a step behind. But whereas Melville’s film was a hermetic examination of the militaristic structure of the Resistance, “Army Of Crime” backs up a few years before there was a strong structural foundation. “Army Of Crime” also does a terrific job of showing the hard consequences this rag-tag band of freedom fighters brought upon their families. The mother of Thomas Elek doesn’t partake in crimes herself, yet she loses her business when the collaborating French police ransack her restaurant. Her only comments on the situation resonate when, after seeing Thomas come home late one night, she remarks that she knows he’s safe now that he’s home and she’s glad his actions are part of a larger conscience. While “Army Of Crime” largely concerns itself with the well edited and exciting sequences of violence and subterfuge, it also carries an enormous amount of respect and emotion for the more mundane details in these people’s lives. Fatalistic from the very opening scene, there’s little doubt for the livelihood of this small Resistance group in “Army Of Crime“. As the end credits suggest, only three of the men and women survived the war in concentration camps. “Army Of Crime” is a hugely overlooked entry in the genre of World War 2 Resistance films. Shown as part of the Rendezvous With French Cinema series in New York in March of last year, it received a marginal release in theaters but has found its way onto a sunning Blu-Ray edition. Peter Weir’s “The Way Back” gives a select few of these imprisoned people a small slice of hope. As the film opens, young Janusz (Jim Sturgess) has been condemned as a Party conspirator by his very own wife and sentenced to the harsh confines of a work camp in Siberia. He struggles through daily life until an escape plan falls into his sights. With an aging American (Ed Harris), a violent Russian thief (Colin Farrell) and several others in tow, Weir’s film is a trip though the most uninhabitable part of the Eastern world as the men travel towards freedom in Mongolia and then eventually India. Partly financed by National Geographic, Weird does his best to frame the film in a stately manner, revealing the incarceration by nature with extreme force. His main visual trope, though, does work as he commonly pans around the edge of a mountain or sand drift to reveal the characters slogging through an endless sea of blowing snow or heated sand dunes. While the characters themselves are mostly stock, “The Way Back” is an invigorating tale of survival that never holds back easy sentiments. There are key deaths and grisly ideas hinted at (think cannibalism). The ending is a bit stretched, yet it somehow works and adds depth to the main character of Janusz and the single-minded determination of his group of escapees to die free men. Perhaps the best link between both films here is the enduring wish to give familes a reprieve from the seemingly hopeless environment of Europe during World War 2. For Missak in “Army Of Crime“, it’s the simple wish that his wife will survive and have a child. For Janusz, his long trip is all about redemption and forgiveness. Yes, both films place themselves in the murky and amoral times of war, but as “Army Of Crime” and “The Way Back” show, the only tangible motivation is the preservation of human life for generations to come. While I wasn't a huge admirer of Nobuhiko Obayashi's smash cult success "House" late last year, his work has been on my radar now. Anytime a virtual unknown is rediscovered and given a proper Blu Ray Criterion release, my cinematic senses spike. Obayashi has had a long and varied career and with the second film I've been able to track down entitled "Girl Of Time", its clear Obayashi loves creating modern fairy tales that blend extra terrestrial leanings and robust (sometimes awkward) humor. Released in 1983, "Girl Of Time" (aka "The Little Girl Who Conquered Time") spins the same type of story involving innocent students becoming embroiled in something sinister... this time without spinning decapitated heads and eerie cats. In fact, "Girl Of Time" feels like one of those movies that would have fit nicely into the Disney channel's Saturday night stable of mildly weird kid movies i.e. "Something Wicked This Way Comes" or "The Peanut Butter Solution". It's sweet at times, visually unique at others, but ultimately moving in its depiction of young girl Kazuko (Tomoyo Harada) who, after school one day, accidentally breathes in the fumes of a broken chemical in her school's laboratory. She soon realizes that she's living one day ahead in time, able to see future calamities and save them from happening to her classmates. She has a crush on an older boy who isn't what he seems to be, continually disappearing to pick flowers. All of this is handled with a delicate, languid pace that develops the relationship of Kazuko and her two male friends with a gentleness. The sci-fi aspect of the film is hinted at, but the real motivation seems to be that awkward stage of budding young love that disorientates space and time naturally. "Girl Of Time" is not available on Region 1 DVD, but if one looks hard enough and wishes to develop their viewership of a challenging Japanese filmmaker, it can be found.